Looking for comfort & luxury, yet still have that down-to-earth outdoors experience? Welcome to Mill Haven Place Glamping and our rural, tranquil site that is only a 20 minute walk to the sea and the Pembrokeshire coastal path. The Yurts each have their own private areas, a canvas covered camp kitchen, which is fully equipped with cooking equipment, table and benches. There is also a fire pit (seasoned wood available for sale on site or bring your own), and a picnic table. 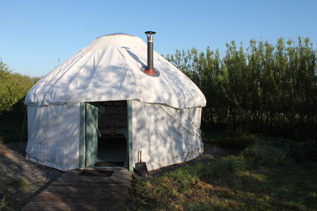 Inside each yurt there is a cast iron king size bed, 2 single futon chairs/beds, a set of drawers and a wood burner (there will be a bag of logs inside the yurt for each booking, after which there will be wood available for sale on site). 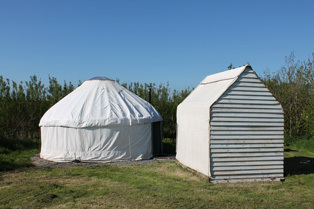 Dogs are allowed with yurt bookings but please keep them on a lead. Linen is provided but please bring your own towels. 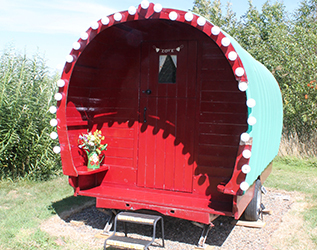 The Cwtch Wagon is the newest member of our team and is a cosy, mini Gypsy Caravan. The Cwtch wagon sleeps up to 2 people and has an elevated double bed inside with storage space underneath. There is a fire pit outside so you can enjoy camp fires under starlit skies. We also provide two deckchairs and a picnic table. There is a fully equipped camp kitchen for your use. Linen is provided (not towels). We do not allow pets in the Cwtch Wagon. The yurts and gypsy caravan are clustered around a very young 2 acre woodland (trees planted in 2010) all within sight of one another and so give a great sense of a camping community, creating a very safe environment for families. However, each one can provide enough privacy if you’re wanting to get away from it all, particularly outside of the main school holidays. When booking a glamping holiday with us you will arrive at our beautiful, Pembrokeshire eco campsite in an idyllic and tranquil setting 15 minutes walk from a secluded beach cove and the Pembrokeshire Coastal Path. 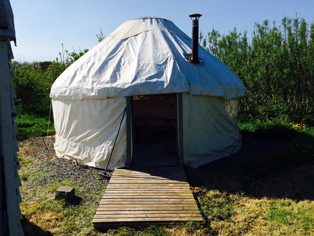 We have 3 traditional mongolian yurts on site with internal flooring, comfy king size beds, wood burning stoves and 2 sofa chair beds. 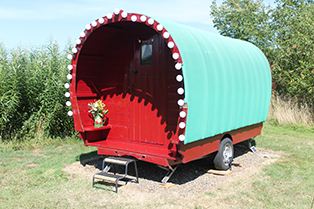 We also have the Cwtch Wagon, cosy mini gypsy caravan for 2…..